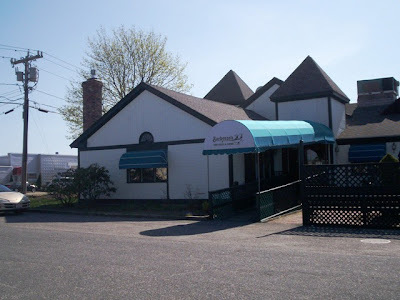 In the past, my aunt has mentioned Barbyann's restaurant to my mother as a "must visit" when we're in Hyannis because of their delicious food and nautical atmosphere. Because we don't really know Hyannis well (other than the main drag - Route 132), Mom printed out directions from MapQuest and we were on our way. When we found the place, we were shocked to learn that it is basically one street behind our favorite Mexican restaurant, Sam Diego's! We pulled into the parking lot, which was empty, at around 4 p.m.
After walking up the ramp and entering the lobby, Mom and I realized that we were the only two in the place. A hostess came over to greet us while I noticed some take-out menus sitting on a shelf and grabbed one. The hostess/waitress named Lisa asked Mom and I if we were OK to sit in the pub area, and we agreed. She showed us to a small table at the back of the pub facing their large bar and left us with two large menus. When Lisa returned to take our drink order, Mom and I requested two Diet Cokes, which promptly arrived in real glasses. Mom and I still needed a minute to decide what we wanted, so Lisa left us alone to choose our meal. When she returned, Mom ordered the fresh fish sandwich ($8.99) with steak fries and I ordered the tuna melt ($7.99) with spicy fries. Because we were only getting sandwiches, we also ordered an appetizers of crab cakes ($8.99). After all, we were in Hyannis. Why not keep the seafood theme going? Lisa took away our menus and left us to check out the interior. Barbyann's is very "Cape Cod." 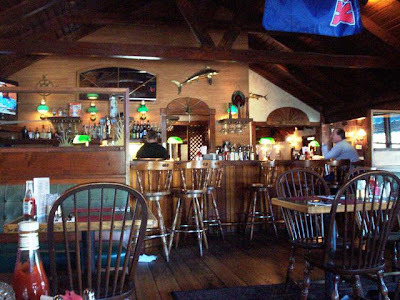 With gold fish, boat, and compass decorations hung throughout the largely wooden space, you almost feel like your dining at some quaint seaside barroom than a family restaurant. Television sets hung in the corners of the room while oil lamps sat atop every table. The green and gold bar lamps went well with the magenta place mats, and the floral print on the plush banquette and oriental rug popped when placed against the rust print wallpaper. Very old-fashioned, but very cozy. There were no booths in the bar area, but there were plenty of windows scattered around so that customers could smell the fresh air. On a nicer day (it was a little cold), Mom and I would have gladly had lunch in their outdoor dining area. There were even string lights wrapped around the large wooden rafters on the ceiling. So cute! Other menu items at Barbyann's include the grilled sashimi tuna salad ($11.99), the Commander's surf and turf (priced daily), baked stuffed shrimp ($17.99), fresh swordfish steak ($17.99), Admiral Snarky's surf and turf ($21.99), Fisherman's platter ($19.99), baked stuffed scrod ($17.99), grilled tuna ($17.99), fried scallop roll ($10.99), and the lobster salad roll ($17.99). For something other than seafood, Barbyann's has a list of burgers, Mexican foods, soups, appetizers, and entrees including the New York sirloin ($19.99-21.99), Bubba's best babyback ribs ($17.99), and grilled chicken teriyaki ($13.99). They also make all their salad dressings on site, and offer a Sunday brunch available from 11 a.m. to 2:30 p.m. which features eggs Benedict, omelets, and Sunday roast dinners. Before our appetizer arrived, some other patrons had come inside and were also seated in the pub area. We noticed that they were served bread, which we were not. I assume it was because we had ordered sandwiches. Still ... I really like bread. Oh well, maybe next time. 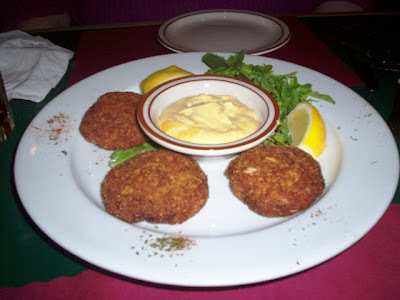 Lisa returned to the table with our order of three lump meat blue crab cakes accompanied by a cup of Old Bay dijonnaise sauce. They looked, smelled, and tasted fantastic! They were nice and crispy on the outside, but very soft and tender on the inside which isn't always the case with crab cakes. Some of the others that we've had were very bready and dry, but these were very moist and delicious. Even the sauce wasn't bad - not too sweet; not too tangy. After spotting that both Mom and I had chugged away our Diet Cokes, Lisa returned to our table with a pitcher of soda to refill our glasses. Before long, our topped off Cokes were joined by our sandwiches. Both looked great, and we couldn't wait to dig in. Mom's fish fillet was a good sized piece with a crispy outside and a tender, flaky inside. She loved it. It was served hot on a large, fresh bulky roll and topped with Mom's choice of American cheese. The plate came with tarter sauce and a pickle, which she handed over to me. Her fries were very hot, crisp, and potatoey. 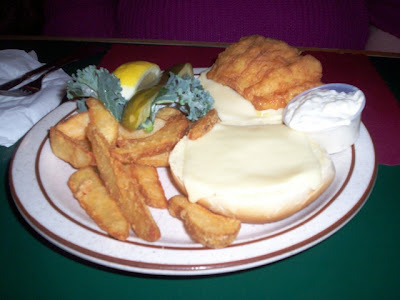 Mom usually orders fish and chips, but today she was brave enough to try the fish sandwich and was not disappointed. She would definitely order this again. My tuna melt was also fabulous, but the fries weren't that great. 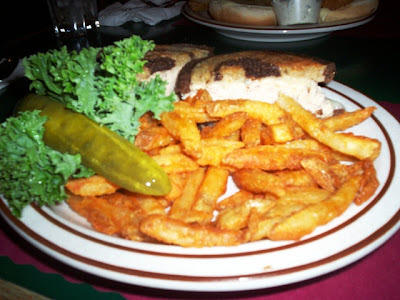 Accompanied by a pickle, the tuna melt was served on fresh marble rye (yum) and was very tasty. The white meat tuna with melted Swiss was a great flavor combination. The real name for this sandwich is "Lisa's Tuna Melt." I wonder if we were actually being waited on by Lisa herself? Either way, it was a great sandwich. However, the fries had no middles! In other words, the fries were so overcooked that the potato inside had disappeared, leaving only the shells. Since I'm not really a fry kind of person, it wasn't a big deal. However, Mom's tasted 100% better than mine. I will definitely order the plain steak fries next time. We left $37.50 on the table for Lisa which included a 20% tip for her great service. Before our long car ride back to Fall River, Mom and I used the restroom. Because it was located off of the main dining room, we got to sneak a peek of what that looked like, and it was quite nice! The restroom was actually very clean and adorable. It must have been the entrance of swinging wooden doors like in an old time saloon that won me over. Stuffed, Mom and I walked out of Barbyann's and headed back to my car. We noticed that the restaurant parking lot was starting to fill up, and we definitely knew why. My aunt was right - if you're ever in Hyannis, stop at Barbyann's for some great tasting food. We can't wait to go back and try one of their delicious-sounding entrees. Barbyann's is open from 11:30 a.m. to 9:30 p.m. Monday through Saturday, and 11 a.m. to 9 p.m. on Sunday.